After winning his first clasico on the weekend, Zinedine Zidane’s Real Madrid travelled to Germany and faced Dieter Hecking’s Wolfsburg. One of the most interesting features of the game was the defensive scheme chosen by Hecking, who opted for what resembled a 4-1-5-0 structure when the opposition were building possession. Andrei Schürrle dropped into the midfield line and was oriented on Casemiro whilst Arnold and Guilavogui tracked Modric and Kroos respectively. These man-orientations are a common aspect of Hecking’s defensive game but this particular shape was something we haven’t seen much previously. Gustavo shifting over to cover Kroos when Guilavogui moves up to create access on Ramos. The man-oriented movements of the midfield were particularly strong as they timed their movements out early and well to maintain coverage of any dropping movements of the Madrid midfield. Arnold and Guilavogui made it very difficult for Modric and Kroos to receive the ball in space, let alone in strong areas of the pitch. In deeper positions, Gustavo would take on a more zonal role but would move out of position to cover a ball-near Madrid player when necessary, usually picking up one of Modric or Kroos when their marker moved up to pressure higher. This 5-chain in midfield, supported by the lone pivot Gustavo just behind gave Wolfsburg good protection in wide areas. Without access to Modric or Kroos, Madrid would look to build in positions close to the wings but the opposition’s midfield shifted well to close the space. The aggressive man-marking from the full-back made it difficult for them to break the lines effectively in these wide areas and Madrid’s penetration was lacking. Through this shape, the home side looked to blunt Real Madrid’s construction of possession and stop them from making a clean progression of the ball. With Modric, Kroos and Casemiro covered by Wolfsburg players, there were no clear passing options for Ramos or Pepe and their ability to bring the ball out from the defence was reduced. Casemiro made some attempts to disorganise these man-orientations through forward movements uncommon from a defensive midfielder, however this didn’t have much of an effect on Wolfsburg’s defensive scheme. Through man-orientations, Wolfsburg looked to stop Modric and Kroos from receiving possession. In deeper positions, the wide man-orientations often lead to a 5 or 6-chain in the defensive line as Henrique and Draxler would largely follow their opposition full-back. This helped Wolfsburg secure the wing spaces better where Madrid were quite frequently looking to break through with Ronaldo and Bale. The weakness of such a shape often comes in the centre, as the wide midfielders aren’t able to support the central midfielders however Real Madrid didn’t often show a capacity to be able to take advantage of this area. At times there were some problems with compactness in the midfield. Due to the man-oriented movements of Arnold and Guilavogui, the two 8s were quite commonly moving high up the pitch and were at times the most advanced player for the home side. 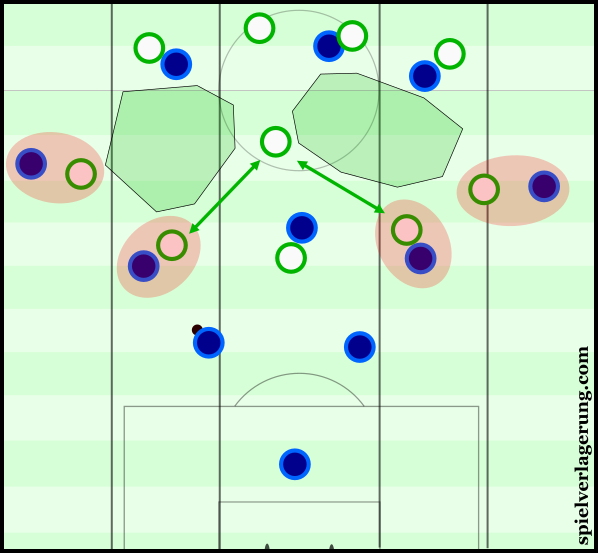 This resulted in quite large distances appearing between the two 8s and Gustavo, who acted as Wolfsburg’s lone 6 in the centre. These gaps were emphasised due to the similarly-man-oriented roles of the wide midfielders, who were both quite focused on their respective opposition full-backs. Gaps around the half-spaces began to appear due to the man-oriented 8s and wingers. The defensive midfielder often had large spaces to cover and the lack of diagonal/spatial compactness from the home side made them situationally vulnerable against Madrid’s attack. With Gustavo central, both of the half-spaces were particularly open and Real Madrid were able to situationally exploit this deficiency to limited success. Zidane’s side weren’t able to fully exploit these moments largely as a result of their inability to space themselves sufficiently. Real Madrid’s problems with their positional structure in possession has been prevalent for quite a long time now. It was one of the biggest tactical reasons why Benitez failed quickly at the start of the season and has been a factor behind numerous bad performances this year. When in possession of the ball, Madrid struggle to position themselves as a team to create structures in which they can effectively circulate the ball. The inability to space themselves sufficiently often results in a disconnected possession game with an isolated attack. Against Wolfsburg’s 4-1-5-0, there were quite frequent positional switches across the midfield in what was quite a dynamic shape yet this was not effective at all. Between the three midfielders, there was rarely a forward passing option during build-up and in a number of scenes, all three were behind Wolfsburg’s defensive shape and access into the centre was almost impossible. Madrid’s weak shape with the midfield too deep, no forwards options and a lack of central presence higher up. With these players close together, there were many connections through the first 2 lines of Madrid players but these connections weren’t particularly good. The short distances between teammates meant that they often occupied the same spaces and blocked the ball-carriers options by getting in the way of lanes too. It was rare that these midfielders would take up positions within gaps in the Wolfsburg defence too, meaning few of these connections would result in a pass which would break the first line of defence. The gap between the midfield and attacking three was insurmountable for large periods of the game and the lack of connections from Ronaldo, Bale and Benzema made it very difficult to progress the ball into attack effectively. Because of this disconnect, Wolfsburg were able to play with such an aggressive midfield as they didn’t have to worry too much about Madrid forwards finding the ball in the gaps I mentioned previously in this article. On the rare occasion that they did manage to find the ball in these areas, they weren’t able to develop the attacks into anything threatening. Again, this was in a few ways a result of their weak structure as the player who initially received the pass never had many options to continue the ball forward. Any combinations they attempted weren’t co-ordinated well and players such as Ronaldo and Bale had limited ability to participate in them. Without a means to maintain control over the ball as they brought the attack forward, these moments usually were broken down by effective pressure from the deeper Wolfsburg players. As a result, we could see a large amount of long balls being played towards Ronaldo who came further inside as the game developed. These long balls showed their inability to play through the Wolfsburg lines as they completely bypassed the midfield in the hopes of finding the forward behind the defensive line. Despite a couple of these passes finding their man accurately, the attacking potential building off from these moments was weak as the Portuguese forward was often isolated and wasn’t able to bring others into play effectively when he had chance. After a spirited performance in Barcelona, Madrid’s biggest issues were exposed well by Wolfsburg where Hecking once again proved himself as a competent coach. Their 4-1-5-0 shape stifled Madrid’s construction of possession well whilst Zidane’s team caused themselves problems just as much as their opposition did.